Create a stylish and comfortable living room or family room with this reclining sectional sofa. Cozy seats feature high plush split back cushions and pad over chaise seats for full body support. 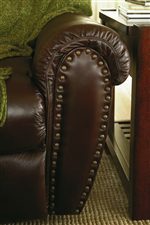 Rolled arms with classic nail head trim add a touch of traditional style to this configurable sectional. The console loveseat features storage for small items such as remove controls and magazines, with built-in cupholders to keep your beverages close. A pullout queen size sleeper adds even more convenience, allowing you to easily accommodate overnight guests. Great for watching a movie or catching the big game, this sectional will be the perfect addition to your home. The Summerlin Traditional Reclining Sectional Sofa with Sleeper and Nail Head Trim Accents by Lane at AHFA in the area. Product availability may vary. Contact us for the most current availability on this product. 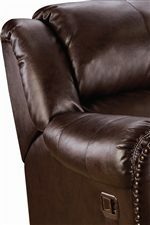 214-07 Left-Arm Facing Sleeper Sofa, Queen 1 81" 41" 42"
214-66 Right-Arm Facing Double Reclining Loveseat With Storage 1 72" 41" 42"
214-04 Wedge 1 48" 41" 42"